In this resource, students participate in three activities to engage them in the 2018 Winter Olympics in fun, yet challenging ways! 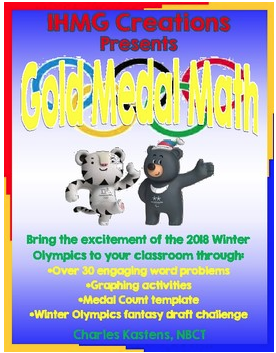 First, students use several sports from the Winter Olympics to practice and refine a variety of math skills through over 30 word problems and graphing activities. Next, your students choose five participating nations from this year's games and create a graph to follow their success. Finally, you and your class will have the opportunity to take part in a fantasy football type of "draft", where you will choose five countries to represent your team throughout the Olympics. Each nation has a value, and you have to construct your team using a $100 budget. This resource could be used in a whole class, small group, or intervention setting. However you choose to use it, I believe you and your students will find it beneficial.